Diamx offers the most advance cloud based ERP to maintain single and loose diamond inventory with accounting management to diamond industries. It is a robust inventory management software which covers almost all requirement of diamond sales management. Diamx is a comprehensive desktop based application with one database on cloud server and its doesnt matter how many offices, branches, outlets or factories your organization possess. Dimax software allows your staff to search diamond inventory and take action like send to memo, sales order, to sale, branch transfer, issue for lab process and many more actions. It has an easy to operate and understand rich user-interface, robust software tech and great concepts. By using Diamx - Diamond sales inventory, we let your team focus on the core business activities with help of lots of MIS reports and deep diamond pricing analysis features and many more automation intelligence process which makes your day to day operations run efficiently. 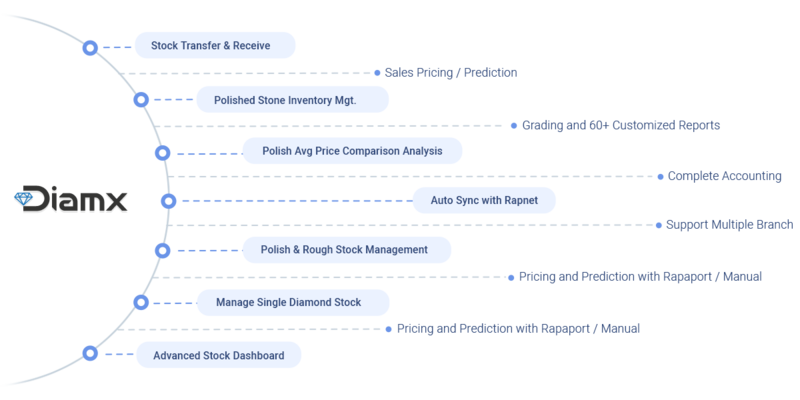 Dimax also update and upload diamond inventory to RAPNET and on custom apps automatically which make your team to manage inventory on single platform instead of manage it on multiple platforms. Auto Stock pricing according to updated RAP Price. Flexible Centralized stock inward using excel. Integrated with online website and mobile apps.